Normal postsystolic dilation of the heart cavities, during which they fill with blood; diastole of the atria precedes that of the ventricles; diastole of either chamber alternates rhythmically with systole or contraction of that chamber. the period between contractions of the atria or the ventricles during which blood enters the relaxed chambers from the systemic circulation and the lungs. Ventricular diastole begins with the onset of the second heart sound and ends with the first heart sound. Compare systole. See also adiastole. The period in the heart cycle when the main pumping chambers (the ventricles) are relaxed and filling with blood from the upper chambers (the atria). the phase between beats when the heart muscle is relaxed, and the chambers are filling. See also cardiac cycle, electrocardiogram, venous return. Normal postsystolic dilation of the heart cavities, during which they fill with blood. n 1. the rhythmic period of relaxation and dilation of a chamber of the heart during which it fills with blood. diastolic pressure. The normal pressure in the adult is approximately 120/80 mm Hg (systolic/diastolic) and increases with age from 128/85 at 45 years of age to 135/89 at 60 years of age. See also blood pressure classification. 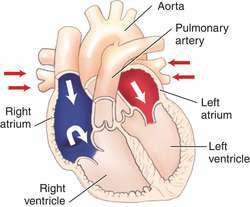 the phase of the cardiac cycle in which the heart relaxes between contractions; specifically, the period when the two ventricles are dilated by the blood flowing into them. See also blood pressure and heart. 23 diastole (mm) Interventricular septum thickness in 9. The processing and segmentation of ECG signals, to extract the portions of the signal which indicate systole and diastole, are performed with wavelet transforms. There is an increased myocardial mass because of high levels of insulin in these patients and this may lead to dysfunction in diastole. 3) Ventricular diastole includes isovolumic relaxation, early passive filling after mitral valve opening, and active filling during atrial contraction. Mean septal and free wall thickness during systole and diastole in group one and two were more than group three. However, this mechanical model cannot simulate passive relaxation of the ventricle during diastole, nor the resetting of the sympathetic nervous tone or the changes in intrathoratic pressure during respiration; it can quantify the different effects of dyskinetic and akinetic aneurysms of different sizes on ventricular function. La mayoria de los soplos funcionales estan causados por vibraciones provocadas por la eyeccion de la sangre del corazon durante la sistole o durante el inicio de la diastole. Larger volume balloons like MEGA are able to displace more blood in the aorta during diastole, which can result in improved augmentation and unloading. This can, for example, show the blood within the cardiac chambers, as illustrated during diastole and systole in Figs 7b and 7c, respectively. To calculate the fractional shortening index, the diameter of internal cavity of left ventricle at the end of systole and diameter of internal cavity of left ventricle at the end of diastole are measured. We show that patients with idiopathic DCM have greater left ventricular dimension in systole and diastole on echocardiography, more radiographic cardiomegaly, and lower contractile capacity on echocardiography and cardiac catheterisation. Corrugated Form #32 comprises a footed vessel in which the rhythm of the structural systole and diastole of the vessel sides is less intensely angular and visually jarring, instead gently expanding and contracting (breathing in and out) as the form rises up to an equally gently sloped top, capped again with but a small lid.